IOWCC Christmas Night out – Friday 20th December! A table has been booked at the Bargeman’s Rest in Newport for Friday the 20th of December at 7-7:30 in the evening! We are able to order from the regular Bar menu and I’m told there is live music on later in the evening which should make for a nice relaxed evening! Numbers are limited so if you would like to come please can you let us know so I can keep track of how many spaces we have. Alternatively If you just want to come for a drink later in the evening I’m sure we’ll all still be there! Please let me know if you want to come either by emailing us on membership@iowcc.co.uk or by catching me (Toby) at the weekend Cheers! 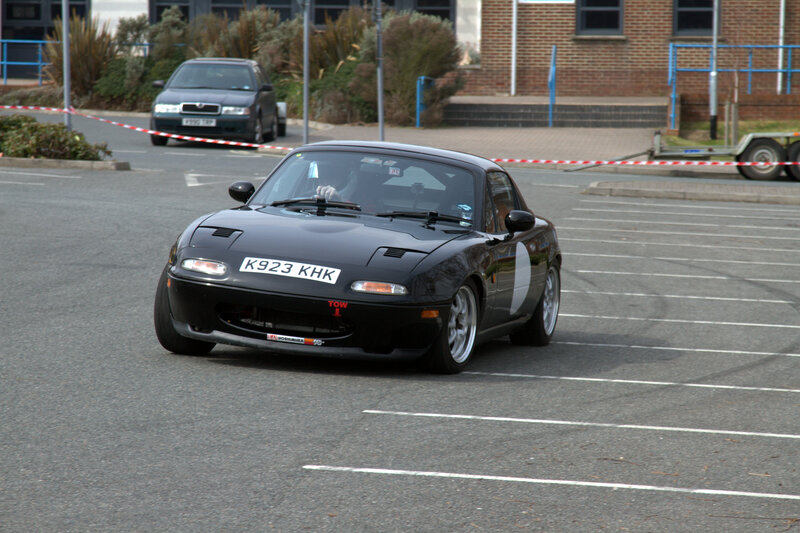 The latest round of the Isle of Wight Car Club championship was held on Saturday at the BAE Systems car park. It was a very wet and cold day but with only one more round after this one to decide the drivers and class championship titles, the competition was getting intense as any mistakes today would put more pressure on the drivers going into the final round. RUN 1 .. First to set the pace was Andy Williams with a time of 54.29 sec, closely followed by Dave Dutch on a 54.32 sec, then Toby Allen on 54.51 sec, then Dave Goodwin on 54.81 sec , James Robbins on 55.27 sec , John Dutch on 56.07 sec . RUN 2 .. Saw many more drivers picking up the pace and as a result the leader boards was changing. This time Dave Dutch put in a time of 53.33 sec and then James Robbins only on a 54.01 sec , then Dave Goodwin on 55.32 sec , then Chris Greenen and Steve Stotesbury on a 56.16 sec and then Andy Williams on 56.62 sec . RUN 3 .. saw Toby Allen setting a new pace of 51.87 Sec for all others to follow, Steve Wells gave chase with a 52.45 sec then John Dutch on 52.83 sec , Dave Dutch on 52.94 sec , Dave Goodwin on 53.06 sec , Dean Long on 53.19 sec ..
RUN 4 .. Saw Toby Allen set a time of 51.68 sec, Hot on his heels was Dave Goodwin on a 51.71 sec then Dan Morgan on 51.89 sec , Steve Wells on 51.89 sec , Adam Greenen on 52.05 sec, Chris Greenen on 52.82 sec ..
RUN 5 .. Once again saw Toby Allen set a target time of 50.64 sec for the others to reach, Dave Dutch got close on a 51.60 sec with Steve Wells hard on their heels with a 52.00 sec , then Daniel Kozakewycz on 52.20 sec , Andy Williams on 52.62 sec , Dean Long on 53.33 sec . It was a very close competition for all the top drivers. But Toby Allen managed a super time of 50.64 sec in his 5th run that was enough to give him the overall win. Round 15 was the final round of the sealed surface championship. This saw many drivers closely following their position on the leader board as today would decide the overall championship and all the class championships titles. Also only having four runs this time would put more pressure on the drivers to get their best run times in early. RUN 1 .. Was John Dutch then Toby Allan only one hundredths of a second behind, then Adam Greenen and Ricky Sheppard. RUN 2 .. Saw Dave Dutch set a new FTD, over four seconds ahead of his brother John’s time, but now Dan Morgan wanted part of the action and he was followed closely by Steve Wells, then Ricky Sheppard, then Kevin Richardson. RUN 3 .. Saw Dan Morgan set a new FTD followed closely by Dave Dutch, then Steve Wells, then Toby Allen and then Ricky Sheppard, Dave Goodwin, John Dutch. RUN 4 .. The final chance to take the FTD and it was once again Dave Dutch to set the new pace, Toby Allen chased hard but it was not enough, Toby was being pushed hard by Neil Glasbey and he was by John Dutch and Steve Glasbey, then Steve Wells. 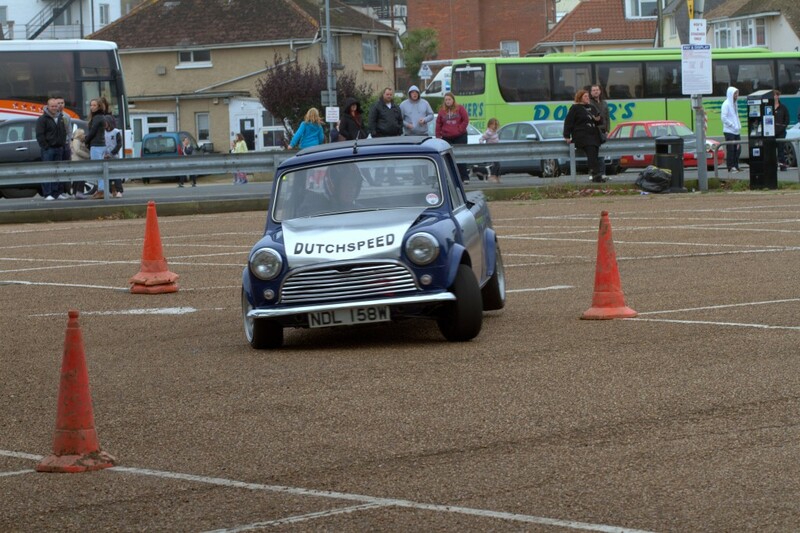 A long awaited return to an old venue for the IOW Car Club. So there was much excitement for the drivers as new venues are in short supply these days, unlike the rain which was the forecast for the day. Luckily it stayed away in the morning so this meant that once again the drivers were trying to get the best times they could in the early runs because once the rain arrived the run times were not going to get any quicker. 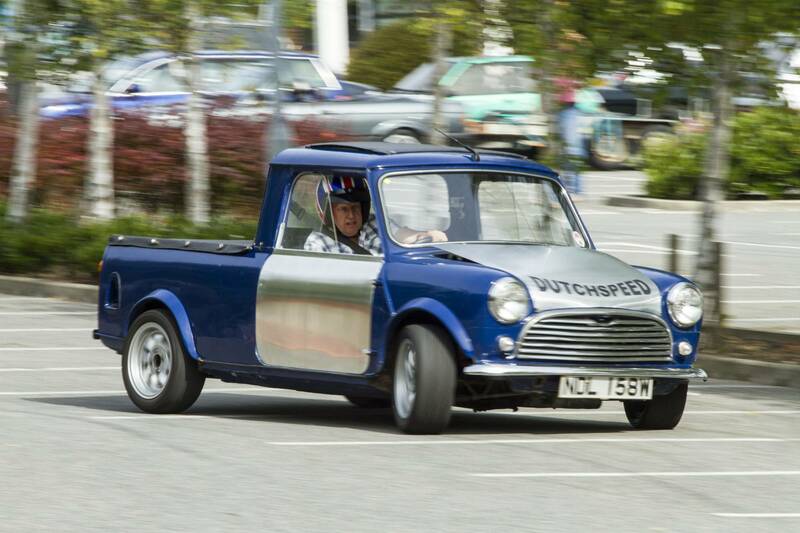 RUN 1 .. First to set the pace was John Dutch in his mini with a time of 59.48 sec, closely followed by Dave Dutch on a 59.93 sec, then Andy Williams on 61.21 sec, Chris Greenen on 62.21 sec , Daniel Kozakewycz on 63.15 sec , Toby Allen on 63.71 sec . RUN 2 .. Saw many more drivers picking up the pace and as a result the leader boards was changing. This time Dave Dutch put in a time of 57.89 sec and then Dave Goodwin on a 59.33 sec , followed by Chris Greenen on a 60.03 sec , then Andy Greenen on 61.67 sec , Ricky Sheppard on 61.92 sec , Vicky Cox on 62.13 sec . RUN 3 .. Once again saw Dave Dutch setting a new pace of 55.98 sec for all others to follow, John Dutch gave chase with a 57.89 sec , followed by Dave Goodwin on 58.41 sec , Toby Allen on 58.93 sec , Andy Greenen on 59.71 sec , Dan Morgan on 59.88 sec ..
RUN 4 .. Saw Dave Dutch set a new FTD time of 55.27 sec, hot on his heels was Toby Allen on a 56.75 sec then Dave Goodwin on 57.34 sec , John Dutch on 58.55 sec , Dean Long on 58.83 sec and finally an outstanding drive by Kevin Richardson with a time of 59.24 sec , to give him his best overall position of the season so far..
RUN 5 .. Saw heavy rain arrive with strong winds , resulting in the track flooded and track markers and timing equipment blown over leading to the top ten on the leader board calling that it for the day knowing that there was little chance their position would change..
Next meeting is round 14 (SS) and will be at BAE car park on Saturday the 9th November and round 15 (SS) on Sunday the 10th November at IOW college. HEALEY WEEKEND..